Fifty-eight year old men are in that transition period between middle-age to being considered a senior citizen in their mid to late-60's. With advanced age comes increased risk of medical issues such as high blood pressure, stroke and high cholesterol. Men also experience a loss of muscle mass and bone density with aging that is partially a result of declining hormones, particularly testosterone. Commitment to an exercise routine that is appropriate for your fitness level and individual health status will improve heart health, muscle mass and help prevent disease risk. Swimming is an enjoyable exercise that aging men commonly engage in for both cardiovascular and muscle toning benefits. The non weight-bearing exercise is particularly beneficial for late-50's men who suffer from sore, achy and stiff joints as well as muscles. Swimming three to four times per week for 30 minutes can improve joint mobility, flexibility and increase muscle tone in the legs, arms and abdomen. Walking is a low-impact exercise that is more forgiving on aging, achy joints than running. Because it's weight-bearing, it can also help improve bone mineral density. Since it can be done from just about anywhere, around the neighborhood block, outdoors or the gym, it's an easier exercise habit for older men to stick with. A brisk walk, done at a moderate-pace, increases the heart and breathing rates to improve heart health and burn off calories for weight-loss. Aim to walk at five days per week for 30- to 45-minute sessions. Bike riding is a no-impact exercise that is gentler on knee joints than pavement-pounding exercises. Men in their late 50's can cycle at their own pace for a leisurely ride or crank up the intensity for a vigorous calorie-burning exercise. Furthermore, men can choose to ride on the road on a light-weight road bike to focus on speed or train for a race or hit up the trails on a mountain or hybrid bike for a thrilling ride. Cycle two to three times per week for 30 to 90 minutes as part of an overall exercise routine. Men heading into their 60's benefit from strength training exercises that work the major muscle groups of the upper and lower body. Harvard Health Publications states that men start to lose muscle mass in their 40's and may eventually lose up to 50 percent with aging. Hit the weights two to three times per week with two exercises each for the chest, back, arms, shoulders, legs and core. Exercises include the chest press, reverse flyes, seated rows, lat pulldowns, biceps curls and triceps dips, shoulder front raises and lateral raises, squats, lunges, crunches and hanging leg raises. Aim to do 10 to 12 repetitions of each exercise for a total of two to three sets, lifting a weight-load that causes fatigue by the end of your repetitions. 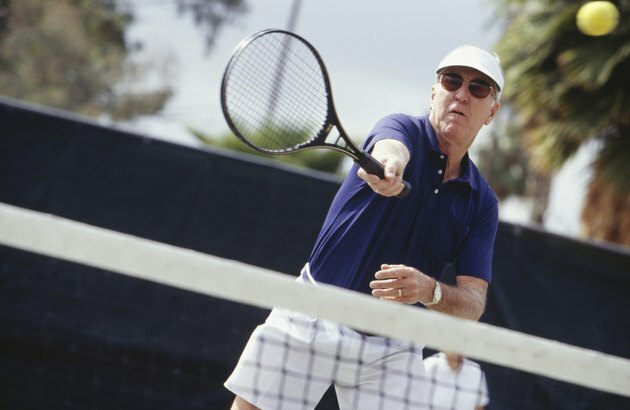 Older men commonly experience a decrease in flexibility and joint mobility as they age. Counteract these declines with stretching exercises that target the major muscle groups including the quadriceps, hamstrings, gluteals, arms, chest and back. Stretches should include quadriceps stretches for the front of the thighs, seated forward stretches for the posterior thighs and cross-arm shoulder stretches for the triceps. Hold all stretches for 20 to 30 seconds and repeat two to three times. Harvard Health Publications: Harvard Medical School: Exercise and Aging: Can You Walk Away From Father Time?